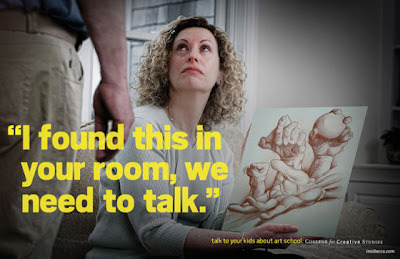 Look at this great new campaign for art school, which encourages families to "talk" about art school using imagery and language reminiscent of the DARE anti-drug program. Click on the title of the post or google breakingcopy.com to see more of the campaign! Wonder where the egg is??? Lol, that's terrific! My brother went to CCS, and I visited it much and even got a scholarship to attend. I decided to start at community college until I could make sure I would.. er.. finish things and turn them in before paying out the big bucks to fail at a large art school. I believe that artist are born not made. My youngest son could draw from the moment he held a pencil. When he started school he could already draw in profile and was amazed at the other children's drawings. He said their drawings of people looked liked balloons with sticks for arms and legs. Oh that is sooo funny! I love it! How great, and such a an amazing thing to go to if given the oppertunity. Art school, totally awesome! I lovelovelove your blog, love coming here! I LOVE this. Odd coincidence, my granddaughter Sara May and I have been talking about art school. At age nine she is addicted to drawing and creating. WONDERFUL! She told me two days ago that she is going to be an artist and art teacher. I feel great that she is thinking of that. If you visit my newest posting you will see the scarecrow she drew while I was working in the studio. She has her own area in my studio and loves to be there with me. wondering where you are, hopefully you just fall into winters sleep. Thank you for your blog and sharing it with us! hopefully everything is ok or will be better soon!